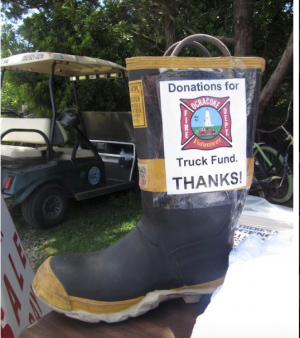 The 14th Annual Memorial Day Weekend Ocracoke Volunteer Firemen’s Ball will be Saturday, May 25th, 2019 this year. This is the most important fundraiser held for the Ocracoke Fire Protection Association (OFPA), and we count on your continued support to help keep this amazing volunteer organization running smoothly and keeping all of Ocracoke well protected. We are currently working towards raising funds for the purchase of a new pumper/tanker truck, for recurrent training and updating our station equipment…. we need your help! Our remote location underscores the need to have all personnel and equipment ready to go as help from any other fire department is at least 2 hours away, putting us in a very vulnerable position. And, unlike other counties, Hyde County has no fire tax so therefore we rely very heavily on individual and business donations for operating costs. Please consider a sponsorship this year! It’s a wonderful opportunity to have your business or family name associated as a part of this great cause, while supporting the local community. Please consider donating goods or services for the live and silent auctions! We always make sure that you or your business is well recognized by having your name, business card and information on the donated product, the auctions are great fun and it’s a great contribution for the fire department. We sincerely thank you in advance for your support and look forward to hearing from you! •Commemorative plaque honoring top level sponsorship of the Firemen’s Ball. •Special recognition at the auction and dance. •Twenty complimentary dinner and dance tickets. •Fifteen complimentary festive OCRACOKE FIREMEN’S BALL commemorative t-shirts. • Commemorative plaque honoring top level sponsorship of the Firemen’s Ball. • Special recognition at the auction and dance. • Fifteen complimentary dinner and dance tickets. • Ten complimentary festive OCRACOKE FIREMEN’S BALL commemorative t-shirts. • Ten complimentary dinner and dance tickets. • Five complimentary festive OCRACOKE FIREMEN’S BALL commemorative t-shirts. • Special recognition to appear on promotional materials, and advertising. • Five complimentary dinner and dance tickets. • Special partner recognition on promotional materials and advertising. • Three complimentary dinner and dance tickets. • Three complimentary festive OCRACOKE FIREMEN’S BALL commemorative t-shirts. All donations are tax deductible. Our federal ID# 56-6076898. Please make a note on your check in the memo area that this is for the 2019 Firemen’s Ball.